Something really cool happened today. I wanted to look up some details on Solitaire, the game that Microsoft Windows made popular around the world. So as any normal person would do, I went to Google and typed “solitaire”. Here’s what happened next. How to play: Search Solitaire in Google. That’s right, you can play a full game of solitaire, right inside Google. You don’t need to click any links or download any apps. It is one of Google’s many Easter eggs, hiding there till you stumble upon it. The single-player game works exactly like the classic Windows Solitaire game Celebrating 25 Years of Microsoft Solitaire: The History, Rules & a Tournament Celebrating 25 Years of Microsoft Solitaire: The History, Rules & a Tournament Solitaire - the preserve of procrastinating office workers and bored housewives - is celebrating its 25th anniversary, and Microsoft is commemorating it with a group tournament. We re-visit the history and rules of the game. Read More you’ve played on the computer. Match the cards in chronological order, alternating between reds and blacks. The end purpose is to to separate each suit. The cool part about this version of Solitaire is that it works fantastically on smartphones too. 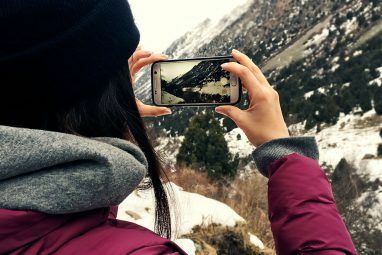 So you can fire it up on your phone with a simple Google search, and not need to install anything 12 Great Mobile Games You Can Play in Your Browser 12 Great Mobile Games You Can Play in Your Browser If you want to play games on your mobile device but don't have room to install them, try these awesome titles you can play right from your browser. Read More . After wasting far too much time on a few games, I wondered what else Google had to offer. I remember there being a playable Pac-Man doodle a long time ago, and hearing of some other games that Google made. So I set out to find them all. How to play: Search Tic-Tac-Toe in Google. As I searched to find when Google introduced Solitaire, the results showed Solitaire wasn’t the only one. Google also hid a Tic-Tac-Toe game in its search results. You can play as the cross or the circle, but know that the cross gets the first turn. Google has different skill settings for the game, so you can start easy and advance to the “impossible” level. Unlike Solitaire, Tic-Tac-Toe in real life has always been a game between two people. The Google version is no different. Play against a friend mode lets you dispense of pen and paper, playing Tic-Tac-Toe on your screen with someone next to you. And yes, like Solitaire, this one is flawless even on mobile screens. 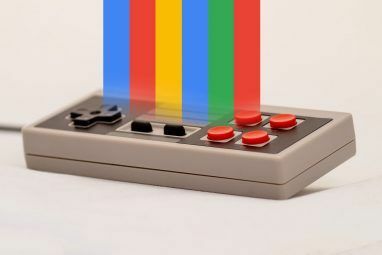 By the way, if you’re at a party, the better way is to play Tic Tac Toe on a TV with Chromecast 8 Creative Uses for Google's Chromecast 8 Creative Uses for Google's Chromecast We've come up with 8 unique uses for Google's Chromecast. Read on to find out just how you can make even more use of your Chromecast. Read More . Like a grand battle royale! Excited to find these hidden games, I hunted for more. My memory of the Pac-Man game served me well. Google indeed made a playable Google Doodle version of the classic arcade game. But things were a little different this time. How to play: Search Pac-Man in Google. Google has taken the classic Pac-Man game, but reinvented the maze with the Google letters. And in the process, it’s made Pac-Man more challenging than ever before. Like always, the aim is to move your yellow Wakka-Wakka man around, eating all the dots. Avoid the four ghosts who are out to kill you. Eating a large dot turns the ghosts blue for a short time, at which point you can eat the ghosts too. Because of the shape of the letters, the maze has some tricky corners. It is not as straightforward as the classic Pac-Man Pacmania: 4 Of The Best Pac-Man Clones Throughout History Pacmania: 4 Of The Best Pac-Man Clones Throughout History Would games even exist if Pacman had never existed? Maybe, maybe not, but it's impossible to deny that this game paved the way for arcade gaming and beyond. Read More , so you’ll need to maneuver carefully. It’s probably best to play this on a computer keyboard with the arrow keys; it was difficult playing it on a phone by swiping for directional changes. Much like Pac-Man is the classic memory for console video games, mobile gaming’s classic is Snake — the little serpent who grew longer and longer as it ate dots in its path. And Google made perhaps the coolest version of it. How to play: Go to the Google Doodle Snake page. The Chinese New Year in 2013 was the Year of the Snake. 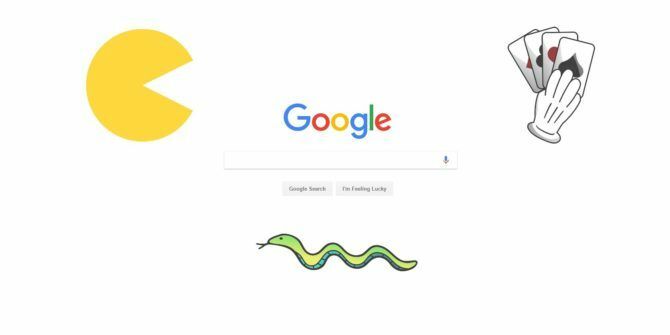 To welcome it, Google developed a playable doodle of the classic Snake game, but with a few improvements. Use the arrow keys to move the snake around, eating things in its path. But you need to pay attention to what you’re eating. Some food will make you grow longer; other food will make you move slower. But avoid objects like dynamite because… well, you know. Google’s Snake isn’t playable on mobile screens, which is a huge disappointment. But it’s still a wonderful game, only made better with the background score inspired by traditional Chinese music. 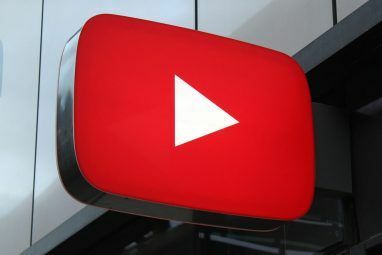 Psst, there’s also a Snake game hidden in YouTube 10 Video Game-Related Easter Eggs From Google 10 Video Game-Related Easter Eggs From Google Google Docs contains a dragon, YouTube's video player contains a hidden game, and zerglings are waiting to devour your search results when you challenge them to a battle. Over the years, many video game-related Easter... Read More ! I finished with Snake, but I wasn’t finished with Google. There were more gems hidden in the search giant’s belly, and I wanted to find them all. Using its own search engine, I found the next game. And what a breakout that was. How to play: Search Atari Breakout in Google Images. Brick-breaker games will never go out of style. Heck, game developers are still reinventing the classic brick-breaker Breakfinity & Ringgz Give New Life To The Classic Brick Breaker Breakfinity & Ringgz Give New Life To The Classic Brick Breaker Breakfinity for iOS and Ringzz for Android each put a unique spin on the classic Brick Breaker, and they're both awesome. Read More today. Google has quietly tipped its hat to the grand-daddy of these games, Atari’s Breakout. Searching for it in Google Images will activate a neat animation. All the photos jumble up to form a line of bricks, and magically, a paddle and a ball appear at the bottom. Start breaking the bricks, using the paddle to keep the ball from falling off the screen. Finish the game and Google will run a new search of a beautiful location, making bricks out of it. And then your next game starts, breaking those bricks of gorgeous places. More fun on the computer than a phone, but hey, it’s entertaining either way. I was having a lot of fun with Google search. Little did I know, Google had even more fun with it. In fact, the company made a whole game based on people’s ability to search. How to play: Go to the A Google a Day page. Usually, trivia games and quizzes implore you not to search the question on Google. A Google a Day proudly lets you search, and makes the game about speed and your ability to use Google search wisely 11 Advanced Searches to Bookmark to Become a Google Power User 11 Advanced Searches to Bookmark to Become a Google Power User Turn yourself into a true Google power user with these 11 advanced searches and pro tips. This will make sure you never have to recall these searches and yet will always have them at your fingertips. Read More . Every day, the site poses three trivia questions. The window is split into two halves. The question appears in the bottom half of the screen, with a Google search window in the top half. Once you see the question, use the top half to search for the answer using the right keywords. It’s all a way to improve your Google search skills. A Google a Day gets tougher with every day of the week. The quiz on Monday is the easiest, and quizzes on Thursday and Friday take some serious Googling abilities to crack. It makes the perfect homepage for your browser, as you will learn something new every day 6 Ways To Learn Something New Online Everyday 6 Ways To Learn Something New Online Everyday The Internet is a double-edged sword - it can be used to procrastinate the day away, or it can be used to learn something new everyday. Here at MakeUseOf, we're particularly focused on the latter.... Read More . As I browsed through the large repository of Google Doodle games Keep Boredom At Bay With Playable Google Doodles Keep Boredom At Bay With Playable Google Doodles The Google homepage is intentionally minimalist, with a distinct lack of pointless detritus that would only serve to divert people’s attention away from the main purpose of the page. Which is to provide a kicking... Read More , I was amazed by how good Google was at making games. These are the type of casual games that you’ll keep coming back to. But what was the best one? Which game do fans think is Google’s most fun Doodle to play? How to play: Go to the Spooky Cat doodle page. It’s not unanimous, but most people recommend the Halloween 2016 Doodle, the Spooky Cat game. And I have to agree, it’s fantastic — especially on mobile. Help Momo the cat defend the magical secrets of her school from a bunch of evil ghosts. Above each ghost is a shape. Draw the shape on your screen to kill the ghost. Do it fast, before the ghosts reach Momo and take one of her five lives. Spooky Cat has only five levels, so you will finish the game soon. But it’s so well-made that you will want to keep playing it over and over. Lovely animations, great sound effects, and addictive gameplay — this one is a winner. Oh, Google has a lot more in store. For example, there’s the T-Rex Run game Chrome Has a Fun Easter Egg When Your Internet Is Down Chrome Has a Fun Easter Egg When Your Internet Is Down The next time you can't access the Internet, try this neat trick to have a bit of Google-provided fun. Read More , which activates in Google Chrome when you are offline. And the Google Doodle page is full of playable games, like the recent platformer made for Valentine’s Day 2017. Which Google game do you like the most? Name it, describe it, and link to it in the comments, please. It is really awesome but did anyone give me advice how can I play these games and did I play these games offline or online? Type "tic tac toe" on Google. You're welcome! You can also play Atari breakout on google on iOS not sure on android though. I believe @Silly might be referring to Atari Breakout, which was influenced by the Atari arcade game Pong. To play Atari Breakout in Google, just do a Google search for Atari Breakout, when the results come back, then select Images. Sometimes it might take a couple of seconds for the game to start, and make sure you have Flash enabled. And then enjoy knocking out the "photo bricks" with the ball. There is a way to get Google to let you play some type of Pong game... I can't remember how to do it, that's why I looked at this article. These are also cool though! Is it this one -- Cube Slam?